Caring for Your Rabbit - INVICTUS RANCH RABBITRY-Where we have lotzabunnies! There are some basic things your rabbit will need. Rabbits need to be kept out of direct sunlight and at temperatures below 85 degrees. A well-built clean cage with enough room for it to lay down both directions located somewhere dry and in the shade if kept outside. Fresh clean water available at all times. I like to use stainless steel crocks, they don't rust and are easy to keep clean. 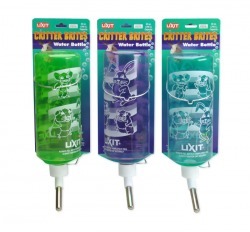 Some people use water bottles, which are great for does with young litters, so they can't fall in and drown. 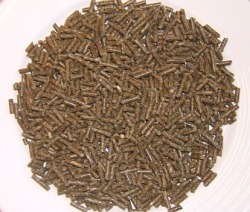 Good quality pelleted rabbit feed from a reliable source. Good quality doesn't mean it has to be expensive or "fancy." Make sure there is no mold in it, as mold can kill rabbits very quickly! Something to occupy your rabbit's time, like a toy, a pine cone, a piece of pine board or something similar to chew on. And of course lots of love and constant attention! This is the MOST important thing to remember about caring for your rabbit. Never take high outside temperatures for granted! High temperatures will kill a rabbit faster than anything else, except lack of drinking water. Your first concern for your new rabbit is keeping it in a cool shady place. Rabbits should never be kept in full sun. A shady spot is best. If it is over 80 degrees Fahrenheit outside, your rabbit should probably be inside or have something to keep it cool. Rabbits are unable to sweat like we do or pant like a dog does. They can only breathe really hard and fast and will soon die if overheated. Put frozen bottles of water in the cage with your rabbit or hang wet pieces of burlap from the sides to help cool the air. Misters outside the cage or fans set to blow cool air up from ground level, but not blowing directly on your rabbit will also help keep your rabbit cool and comfortable. Your rabbit cage should be easy to clean. I recommend all wire. You can always add plywood or plexiglass side panels for winter time, but it should always have excellent ventilation The floor wire should be free of rust and without sharp edges. I really recommend an all-wire cage because it is easy to clean and doesn't harbor the germs and bacteria that wood floor cages can. 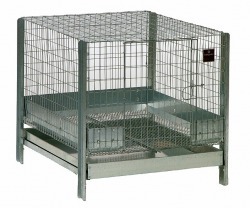 A cage with a plastic floor tray is ok for guinea pigs but rabbits urinate a lot. When a rabbit's feet get wet they can get fungus and that can contribute to the fur on their feet wearing off faster. A rabbit spends most of its life on its feet and they should be well furred. You can give them something to sit on, like a slotted plastic resting mat or even a pine plank. Some people use a slab of drywall but I personally don't recommend that. Cleaning your rabbit's cage can be easily done with a wire brush once a week. If you end up with white urine build up, try a strong vinegar rinse. If you end up with a hair build up, REMOVE the rabbit from the cage and also all feeders and toys and water containers and then use a propane torch to burn the hair off. Don't get the cage wire white hot, it removes the galvanizing and then your cage will quickly rust. MAKE SURE the cage is completely cool again before you put your rabbit back in, I usually hose it off and then let it dry. I realize some of these precautions sound silly, but there have been rumours in the bunny community of it happening. Some rabbits like to be head and shoulders above the rest. Does will sit on top of the nest boxes (to escape their kits) and even bucks like to get to where they can see further (Oooh, look at that doe over there!) You can attach a wire shelf in a corner a foot or so off the floor level if your cage is tall enough for the rabbit to stand on the shelf, not crouch. The cage itself should be tall enough for your rabbit to stand up on its back feet anyway. This helps create good air flow so your bunny has plenty of ventilation. Water Bottles work well inside the house or for does with young litters. If the bottle top is the right size, usually the 16 ounce or quart size, you can use 2 liter soda bottles instead and give them enough water for a hot day. Just make sure you rinse them well first. My friends freeze their water bottles 3/4 full, for room for liquid water and that helps cool the bunnies too. Some rabbits may have been raised on crocks, make sure you know which they had and don't take it for granted that the rabbit will "figure it out by themselves." If you have a rabbit who doesn't learn quickly, you can let another rabbit that is used to drinking from a bottle show it how. Hang the bottle from the outside of the cage securely so the rabbit can easily drink without bending too far over or stretching too high. Crocks are easy to fill and easy to clean. I like to use crocks, preferably stainless steel for outdoor bunnies. If you can afford two per rabbit you can always have a clean one ready and can throw the other in the dishwasher. Make sure it can hold at least a pint to a quart for a small rabbit and 1/2 to 1 gallon for a large rabbit. Scrub them with salt or a vinegar rinse and rinse well. Clean, healthy food every day but not too much. Toys help keep your rabbit happy. Pinecones make great chew toys to keep rabbits occupied. Just make sure you gather them from under unsprayed trees. If in doubt, get them elsewhere. Empty unscented toilet paper rolls stuffed with grass hay are fun too. Cut them in half or even thirds for small rabbits or babies.